City Council Speaker Corey Johnson and transportation chair Ydanis Rodriguez generally have smart things to say about transit, congestion pricing, and shifting to a low-car transportation system. The transportation committee they oversee is an entirely different story. Today, Rodriguez convened a hearing to discuss the de Blasio administration’s “Congestion Action Plan” — introduced as a political stunt in the fall to sap momentum from congestion pricing. The plan relies on NYPD to keep some roadway lanes clear during rush hours, but even if it works as planned, the effect will be negligible. Unlike congestion pricing, it won’t actually reduce traffic volumes. 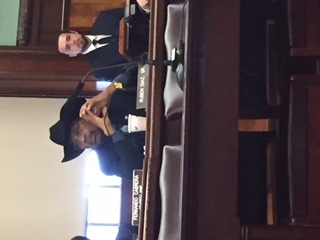 Council Member Ruben Diaz, Sr. at today’s transportation hearing. Launched last week, the new curb restrictions have drawn opposition from businesses and industry groups who claim delivery times aren’t negotiable for many merchants. Those complaints were apparently the impetus for today’s hearing. Other tools at the city’s disposal to reduce congestion were not on the committee’s agenda. Instead, DOT Commissioner Polly Trottenberg listened to council members vent about bus lanes in their districts. It felt like a throwback to the City Council of 10 or 20 years ago, when the main purpose of the transportation committee was to provide a forum for griping about the hassles of parking a car for free on NYC streets. Bronx rep Ruben Diaz Sr., in his second stint on the City Council after an eventful 14-year tour in Albany, set the tone, blaming car congestion on DOT “shrinking streets.” He then launched into a diatribe about the scourge of buses clogging general traffic lanes at the expense of “private citizens” in personal vehicles. The fact that the buses are full of private citizens losing time because people in personal vehicles block bus lanes didn’t seem to register. Fernando Cabrera, also of the Bronx, echoed that complaint, though at least he added that NYPD doesn’t ticket bus lane blockers fast enough. Peter Koo, of Queens, and Rafael Salamanca, from the Bronx, both suggested, in different contexts, that New York should allow more personal vehicles to use bus lanes. The hearing was by and large a wasted opportunity to deliver the strong dose of oversight that Mayor de Blasio’s “clear curbs” strategy needs. It’s a poor substitute for other traffic management policies City Hall could pursue, like placard reform, smarter curbside regulation, HOV restrictions on the East River Bridges, and increased bus priority on city streets. Rather than demand a more effective approach to congestion reduction from City Hall, Rodriguez and Council Member Keith Powers, who represents Midtown, asked only for better communication and thorough reporting on the plan’s effects. Trottenberg defended the city’s approach, implying that “clear lanes” and related strategies were all the city can do on its own. If de Blasio was serious about reducing congestion, Reynoso said, he’d put his political weight behind congestion pricing. “The mayor supporting [congestion pricing], endorsing it, would be a step in the right direction,” he said. The plan relies on NYPD to keep some roadway lanes clear during rush hours, but even if it works as planned, the effect will be negligible. Unlike congestion pricing, it won’t actually reduce traffic volumes. Traffic volume accumulation within the CBD from outside the CBD cordon are at a 40+ year low, according to NYMTC’s yearly Hub Report. Only 2 years saw less accumulation than 2016’s 73K vehicles. Those were 2001 and 2002, which were a result of 9/11. Obviously, there’s another factor driving down average vehicle speeds within the CBD. Nothing in your comment contradicts the text you excerpted. Is the object to reduce congestion (i.e. increase average vehicle speeds) or to reduce vehicle volume? R. Diaz is the worst, he needs to retire already. While he gripes, the SBS Bx6 in the Bronx was jammed up in traffic today despite the very limited bus lanes. I couldn’t believe how many drivers are still violating it despite the cameras. Then there are huge sections without camera enforcement. And the streets of the Bronx have improved dramatically over the years thanks to pretty widespread traffic calming. We still need more, but man is it a whole lot better than a decade ago. He then launched into a diatribe about the scourge of buses clogging general traffic lanes at the expense of “private citizens” in personal vehicles. The fact that the buses are full of private citizens losing time because people in personal vehicles block bus lanes didn’t seem to register. The fact that, if even 10% of those private citizens on buses shifted their trips to private vehicles, the resulting congestion would be beyond crippling didn’t seem to register, either. It is in every motorist’s best interest, on purely selfish grounds, to ensure that modes other than driving are as attractive as possible. The more people choose to ride transit or bicycles, the fewer people will be clogging up street space with private automobiles, and the easier it will be for the remaining motorists to get around by car. There have been over 3,200 deaths and injuries in Diaz district in the last 5 years. You would think he would be focused on that ! Wait! You mean the City Council’s Transportation Committee is just like the Community Board Transportation Committees? What a surprise!